Dr. Niz was just 16 when he sustained a serious injury during a Midget AAA hockey game. A cross-check to his back slammed him into the post, leaving him unable to get up. He was sent the next day to see the pro sports team doctor and physiotherapist of the Winnipeg Jets Team. Dr. Niz thought his leg was the problem as he could barely put any pressure on it, and the doctors did a full workup and rehabilitation protocol. The doctors tried to get him back on the ice as soon as possible, as he was selected to be captaining the All-Star game in 4 weeks. A teammate’s mom suggested he see her chiropractor. She thought her chiropractor was a miracle worker, but Dr. Niz was skeptical. ‘’I told her it wasn’t my back I was having problems with.” He went to the chiropractor, however, as he was desperate as nothing seemed to be working. Within four adjustments over the course of 7 days, he was up to 90% improved and back on the ice. The decision to enter the chiropractic profession didn’t happen until Dr. Niz was in college attending pre-law program at the University of Manitoba when he decided he wanted to work in an industry that would affect people’s health and well-being. He recalled his first experience with a chiropractor, and he knew he would enjoy doing for others what his chiropractor had done for him. He achieved his Doctor of Chiropractic from the Canadian Memorial Chiropractic College in 2000. Since that time, Dr. Niz has become a Certified Chiropractic Wellness Practitioner and practices the lifestyle program Eat Well, Move Well, Think Well™ by Dr. James L. Chestnut. He is extensively educated in Postural Restoration Programs and his expertise in human physiology is incorporated into our clinic’s wellness approach, helping you to heal quicker. 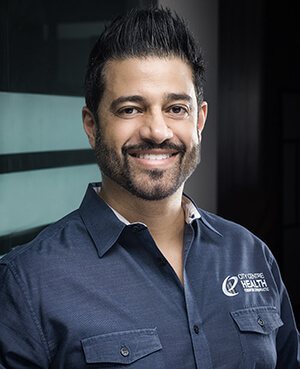 Dr. Niz was the co-founder of Oliver Chiropractic Wellness Clinic in Edmonton before moving to Victoria where he owned and operated Victoria Family Chiropractic Clinic. In 2006 he moved to Australia where he owned and operated 5 chiropractic wellness clinic for four years. He decided to move back to Edmonton in 2010 to be close to his family and back in the city he loves and appreciates dearly. We welcome the opportunity to meet you and help you regain your health. Same-day appointments are available. Give Dr. Niz a call at City Centre Health Edmonton Chiropractic to get started!